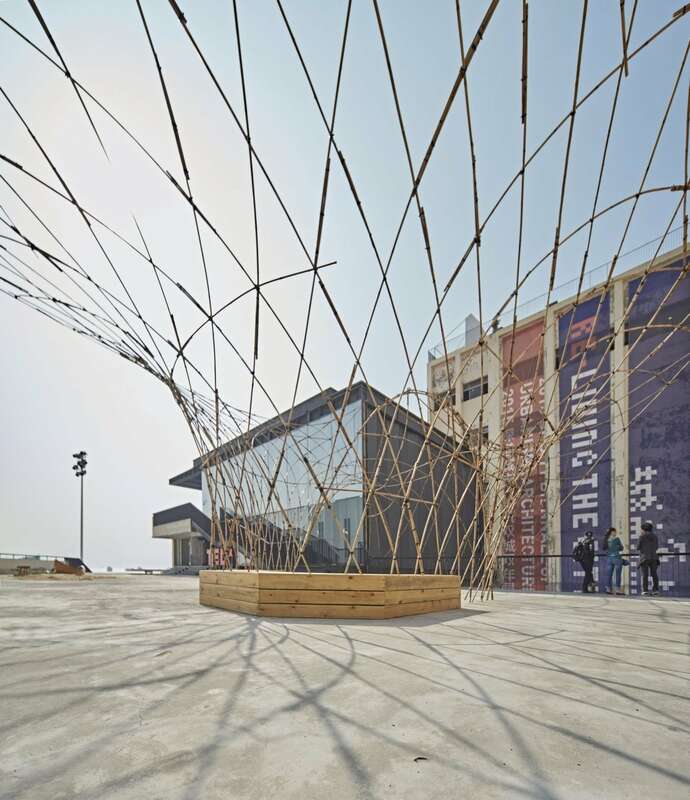 The Bamboo Shelter is a temporary, light-weight, bending-active structure and habitable pavilion built on a rooftop at the UABB Shenzhen 2015 exhibition. The design highlights and gives identity to a space for public gathering. This area is located in between the auditorium and adjacent café and exhibition building. 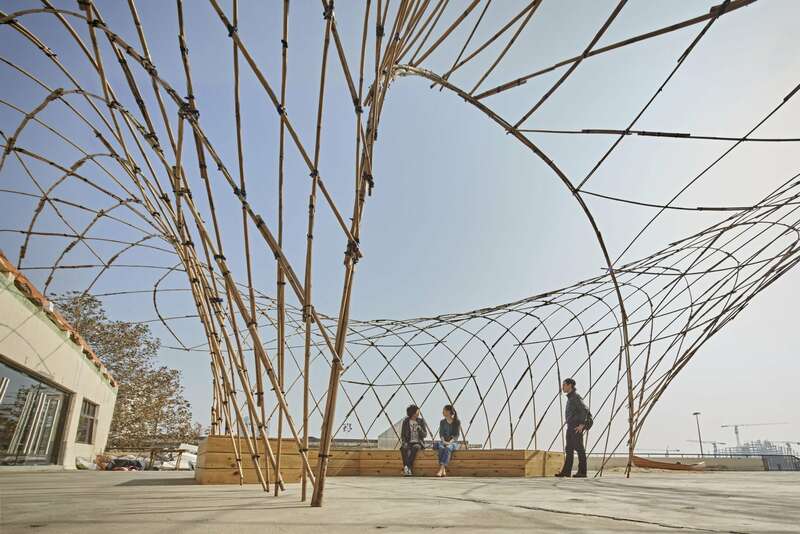 The installation is defined by an undulating bamboo membrane that is suspended between the building edges, bent over the handrail of the walkway up, and pulled down into a central seating area. 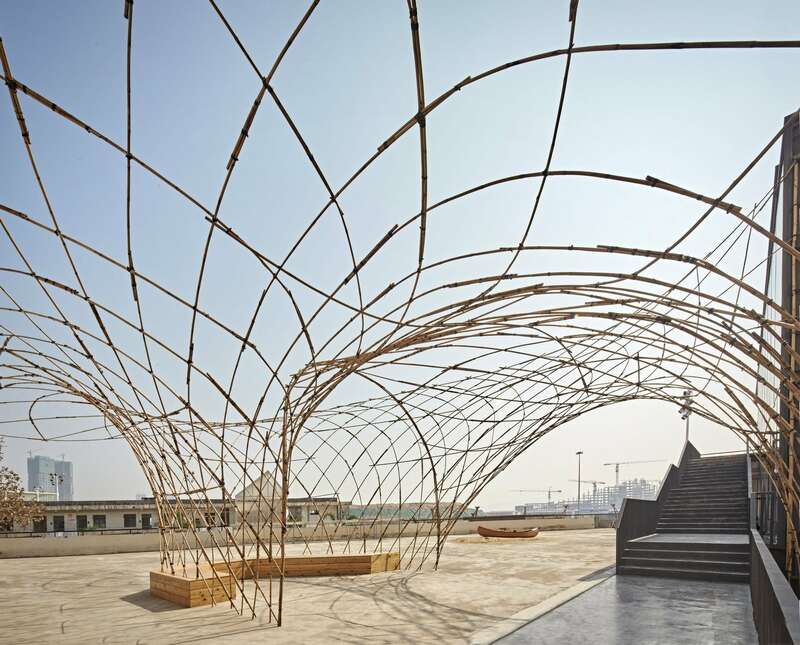 This membrane is materialised by means of a diagrid made from thin bamboo sticks. 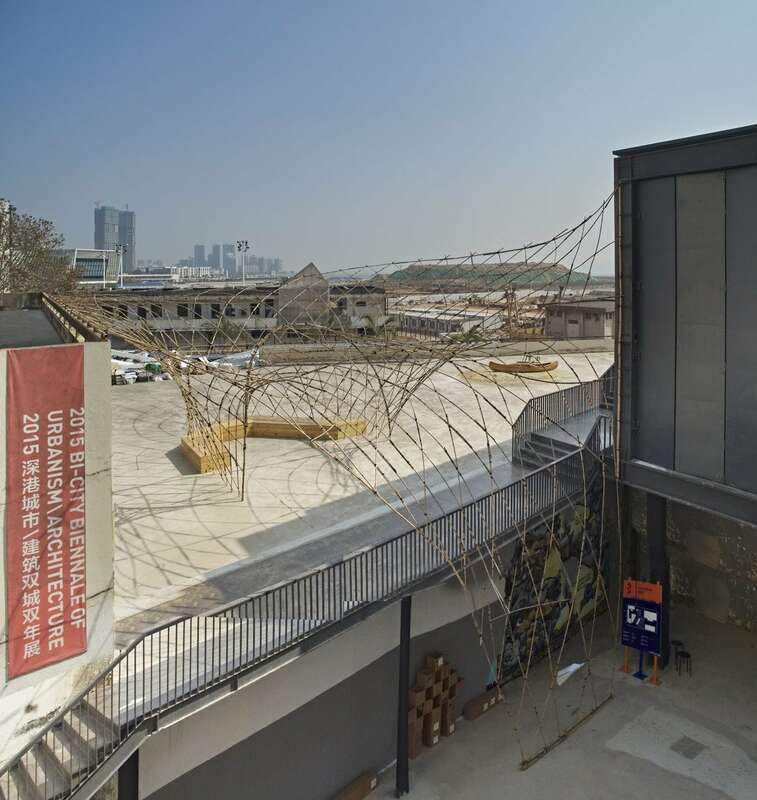 These sticks are bent onsite and manually tied together according to specific building information that was extracted from computer models. These models employ digital real-time physics simulation tools to find form that is suitable for the selected material configuration. Specific annotation and construction documentation algorithms were developed to allow easy onsite construction without the need for conventional architectural drawings such as plans, sections or elevations. 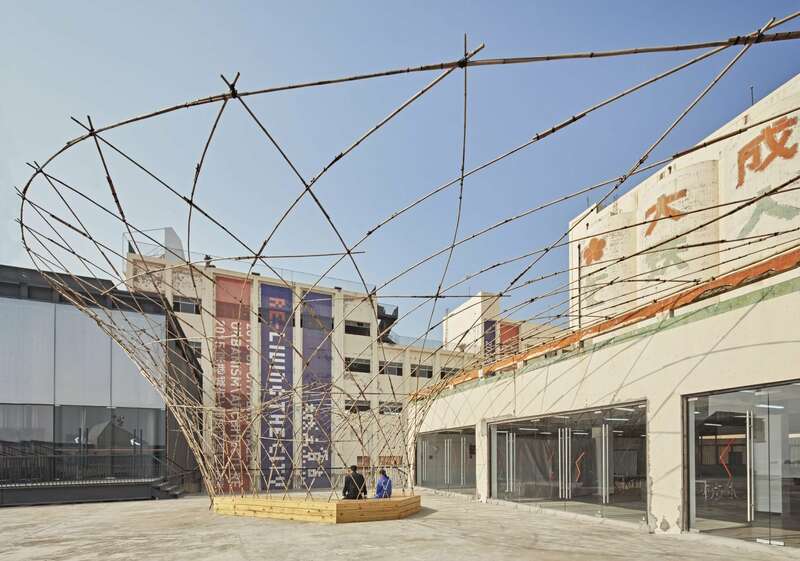 This installation is conceived as a research project within a lineage of investigations on how computational design tools can be strategically inserted into low-tech construction methods to produce innovative architecture. The thesis is that by initiating form-finding exercises from material and construction properties and restrictions, rather than from virtual speculation only, a much more practical and realistic project implementation becomes possible. 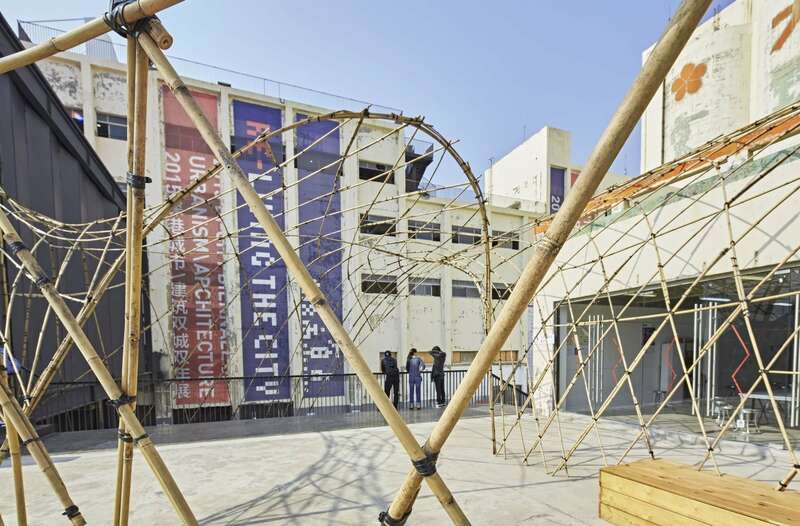 The Bamboo Shelter promotes the innovative use of natural materials which, through their symbolic and cultural associations, enforce the local identity of the project location. But most importantly it illustrates how engaging architectural alternatives are possible from the simplest of means.